After 20 seasons, The Bachelor/Bachelorette franchise is a well-oiled machine. Each season comes with a few guarantees: no person of color will make it to the final four; the promos for future episodes will be unfairly misleading; and there will be a villain. On the current season of The Bachelorette, that person was Chad Johnson, a 28-year-old luxury real estate agent from Tulsa. Jacked on protein powder and the literal piles of meat made available during cocktail parties, Chad was incapable of controlling his temper in front of the cameras. On their very first "date," he called JoJo Fletcher, the woman he was supposed to be impressing, "naggy." Then, when Evan Bass, a wispy erectile dysfunction specialist, decided to roast Chad during a competition, Chad responded by grabbing Evan’s shirt and pulling it so hard that it ripped. After that, he punched a door. But Evan wasn't the only one he had beef with: "I'm going to cut everyone here's legs off and arms off and there's going to be torsos and I'm going to throw them in the pool and I'm going to f*ck up this entire damn thing." Eventually, ABC brought security into the house, a guy with a mere fraction of Johnson’s muscle mass. Whenever JoJo or anyone else confronted Chad for his troubling behavior, Johnson would use some bizarre circular logic to reason that he only made violent threats because the guys just wouldn’t stop picking on him and, well, what else is he supposed to do besides threaten them with physical violence? And after all that, JoJo still kept him around for another episode. It was certainly violence when Stephen Williams slapped Irene McGee on The Real World: Seattle in 1998. When McGee decided to leave the show early, she called Stephen a homosexual on her way out. Stephen, who at the time was outwardly homophobic and deeply closeted, freaked out, pulled open the door of her car, and smacked her in the face. Camacho points out that MTV has a no-violence policy on its shows and removes contestants who cross that line. In this case, viewers actually got to see producers take action on camera. Still, they gave the roommates the option of letting Stephen stay in the house, which they did — as long as he took anger management classes. MTV used to be quick to act, but these days, it seems like the network picks and chooses which stars it removes from its most popular shows. On the Jersey Shore, Sammi and J-Woww traded blows in season two but both stayed cast members for four more seasons. And on Teen Mom, Amber Portwood faced domestic violence charges for attacking her fiance (in front of their child) only after the footage aired. She eventually went to prison (for unrelated charges). As of 2016, she’s still on the show. For Camacho, one of her most memorable reality show moments came from the second season of Top Chef. After a night of drinking, four of the contestants, including Cliff Crooks, decided to shave their heads and the head of Marcel Vigneron, who was asleep at the time. Cliff is shown on camera trying to hold Marcel down. “Everyone knew that it wasn’t meant to be a quote unquote violent event,” Camacho says. “But they were like: You put your hands on somebody. That’s assault.” Crooks was disqualified from the show, on camera. Unfortunately, not all programs are so discerning, and some — like The Bachelorette — may actually capitalize on such behavior. One of the scariest hostilities in reality history happened on the usually innocuous Amazing Race. The CBS adventure series was thrown for a loop when they cast Jonathan Baker and Victoria Fuller in its sixth season. The couple bickered from the start, but it wasn’t until a few episodes in that the full extent of Jonathan’s temper was revealed. After losing a footrace, he shoved Victoria, blaming her for their second-place finish. In another episode, Jonathan raised his hand as though to hit his wife, but stopped himself just in time. Fans of The Bachelorette may have wondered if producers were perhaps forcing JoJo to string Chad along for the juicy plot line. Fortunately, the speculation was short-lived, as JoJo finally dumped him after a two-on-one date in episode four. 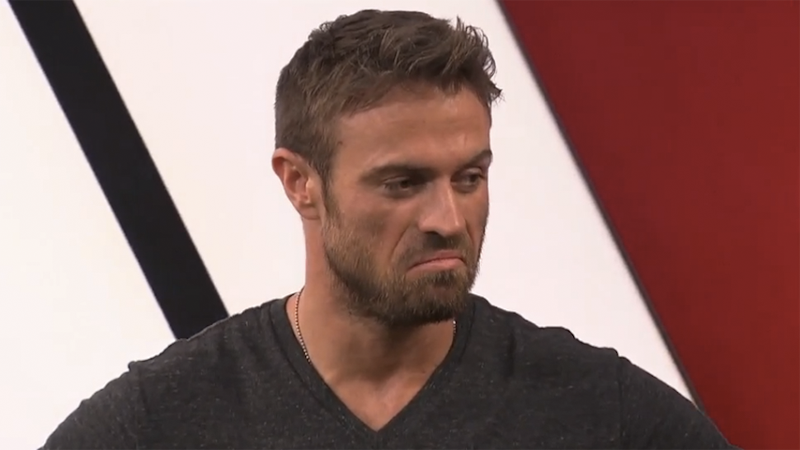 Of course, the network still let his exit bleed into episode five, filming his return to the house for one last manufactured confrontation, probably because they thought maybe this time he’d blow, and partly so they could milk one more episode’s worth of ratings out of him. He didn’t snap, even when Evan asked him to replace his torn shirt, and Chad finally left. Later that night, Johnson was a guest on ABC’s Jimmy Kimmel Live. And later this summer, viewers will get even more Chad on the alcohol-soaked spinoff Bachelor in Paradise, where he’ll rejoin Evan Bass and more of the men who felt unsafe around Johnson and whose limbs he threatened to tear off. Maybe nothing will happen. Or maybe Chad will actually act on some of his threats. Either way, millions of people will be watching. Sometimes, it's easier to stomach a guy like Chad than the grim reality we see on the news.